Clifton Eugene “Gene” Hurst, founder of the Hurst Boiler & Welding Company, Inc. in 1967, passed away on Wednesday, July 22, 2015. Gene Hurst, Founder of Hurst Boiler & Welding Company. Anyone who knew him, in whatever capacity, would certainly agree he was a kind, humble, and inspiring individual who cared deeply for his family and the people who worked for him. 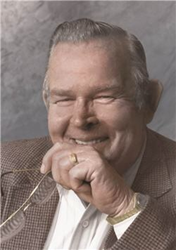 On Wednesday, July 22, 2015, Clifton Eugene “Gene” Hurst, founder of the Hurst Boiler & Welding Company in Coolidge, Georgia, passed away peacefully. An entrepreneur, skilled engineer, and devoted family man, Gene is remembered by all for his kindness, dedication, vision, and inexhaustible will. Not only did he grow Hurst Boiler into one of the world’s leading boiler companies, but he helped to transform the boiler industry through innovation. "We lost one of the greatest men to ever live, a man adored by many, a man of true character, a man that meant so much to so many...my hero, best friend and my grandfather," said Chad Fletcher, Hurst's grandson and Hurst Boiler’s Director of Aftermarket Parts and Sales. An entrepreneurial success story writ large, Gene Hurst started his family business in 1967 with his wife Edna in a shop behind their home in Thomasville, Georgia. He moved the business to its present location in Coolidge, Georgia in 1970, where the company successfully manufactures a full line of solid waste, wood, gas, coal and oil fired steam and hot water boilers and related equipment in a 314,000 square foot manufacturing facility on 17 acres. Forty-eight years later, the business Gene began remains in the family, currently under the direction of the Hurst children: Tommy, Hayward, Teri and Jeff. It is the largest employer in the area, maintaining more than 350 employees at full production capacity. Gene attributed his success to his faith, his family's support, and the dedication of the Hurst Boiler team and customers. “Anyone who knew him, in whatever capacity, would certainly agree he was a kind, humble, and inspiring individual who cared deeply for his family and the people who worked for him,” said Jeff Hurst, Gene’s youngest son and Hurst Boiler’s Director of Marketing. In honor of the memory of Gene Hurst, the family requests a donation be made in lieu of flowers to the Lives Without Limits organization: http://www.liveswithoutlimitsga.org. Hurst Boiler & Welding Company, Inc. has been manufacturing, designing, engineering and servicing gas, oil, solid fuel, wood, waste, biomass and hybrid fuel-fired steam and hot water boilers since 1967. With installations across all industries worldwide, Hurst Boiler is recognized for the highest code standards, innovative engineering and design, Energy Star rating, and renewable, sustainable solutions for green building design and operational efficiency. Visit http://www.hurstboiler.com or call (877) 994-8778. Watch the Hurst Boiler video (https://www.youtube.com/watch?feature=player_embedded&v=a3GVHn2CSyw) on YouTube.